Does your commercial business need pressure washing? Here are some things to consider and how we can help. 5 Benefits of Pressure Washing Your Workplace: A clean office or workshop can stimulate a wonderful first impression to your customers and be a source a great pride and comfort to you and your employees. 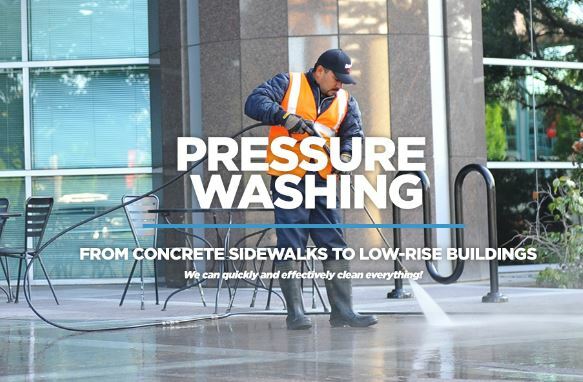 Pressure washing is one of the methods you can adopt in making your business premise sparkling clean. Power washing can be time wasting and tiring yet less effective. For this reason you need to seek services of a company that can relieve all that stress for you. In South Bend, you can get all the professional cleaning services you desire from Michiana Commercial Landscape for these reasons. 1. Cost Effective: You want a clean working environment yet be efficient on spending,right?. Hiring cleaning services is known to be expensive and a luxury only enjoyed by a few endowed companies. However, at Michiana Commercial Landscape, we have come to change that norm. Through pressure washing, our cleaning services are relatively cheap and money saving. In additional to being economical, we keep your surfaces, paint and your landscape free from damage. 2. Convenient: Pressure washing is the quickest and most effective way to keep your working area looking like new. It removes all kind of dirt in a small fraction of the time it would take to scrub manually. As Michiana Commercial Landscape, we deal with the smallest stains that could be hard to remove using other methods. Our swift services ensure that we are out of your hair after just a couple of hours. 3. Ideal equipment. Washing using the pressure method is highly dependent on the equipment. Our landscaping professionals are armed with the required equipment vital for getting off with your work. The professionals have all the necessary equipment from pumps, generators, jet sprays to detergents. With this kind of equipment, you are assured of getting the best services. The various equipment we use carry out specific tasks that will leave your workplace as neat as a button. 4. Expert Services: The knowledge and experience of the experts we deploy to your business premises guarantees quality of the services you will get and the safety of your property. Our cleaning experts have the skill of pressure washing and are keen to protect and prevent your possessions from damage of the water or pressure. The experts have craft of pressure washing your decks and concrete surfaces to leave them intact and sleek. 5. Eco-Friendly Chemicals: Your health and that of your workers is very important. With that in mind, we ensure that any detergents used in cleaning be safe for both the environment and the people. There is an array of pressure washing chemicals in the market. We use the knowledge we have to distinguish what chemicals are recommended for washing and for what purpose to ensure your safety.Cleaning is recommended every now and then depending on the condition of your workplace and the activities going on. Regular cleaning maintenance is a secret in keeping your premises in good condition and preventing mold, algae and other dirt that could cause a lot of damage. Whenever you need any sort of cleaning services, Michiana Commercial Landscapes will be a dial away to cater for your needs.